We all need a repertoire of easy weeknight meals. And since many of us are trying to eat less meat, if some of those meals are vegetarian, even better. My Easy Cheesy Black Bean Enchiladas are both easy and meatless. Using canned beans and a jar of enchilada sauce means preparation time is greatly reduced. In less than 45 minutes, 30 of which is baking time, you can have a delicious home-cooked meal on the table that your family will rave about. I made these last night and David loved them. In fact, he said that I’ve just about ruined restaurants for him because of my cooking. Wasn’t that sweet? On the other hand…what have I done?! Ha! Over medium high heat cook onion and bell pepper in oil until onions are translucent. Add drained black beans and 1/4 cup of the salsa. Heat through and taste. Season as desired. Pour some of the enchilada sauce in the bottom of baking dish to cover. Spoon a couple of tablespoons of bean mixture in tortilla. Add small handful of cheese. Roll and place in baking dish, seam side down. Spoon the other 1/4 cup of salsa over and spread evenly. Pour remaining enchilada sauce over enchiladas making sure to coat the tortillas. Sprinkle with remaining cheese and bake until hot and bubbly - about 30 minutes. Last night I just served them with homemade guacamole (I’ll share that recipe soon) and organic tortilla chips. Mexican rice and a salad would be good accompaniments, too. Ordinarily I prefer cooking black beans from scratch and as soon as I get some room in my freezer I plan to cook a big batch in my Instant Pot and then freeze in 1-2 cup portions. However, sometimes you just need quick and easy. Aldi’s carries organic canned black beans which are exceptionally good. That’s what I used in this recipe. As for enchilada sauce, again, homemade is best but if a jar of sauce in the pantry means I can get a meal on the table on a busy night when I might otherwise be tempted to have David pick up a pizza, I count that a win. Now, if you would prefer your enchiladas with meat and have more time, I highly recommend “The Best Ever Enchiladas”. But for a quick weeknight meal and/or a vegetarian version, you can’t go wrong with Easy Cheesy Black Bean Enchiladas. 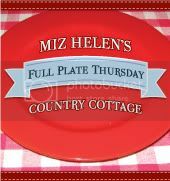 This post is linked up on Miz Helen’s “Full Plate Thursday”. Check it out! Yummy! I’m going to have to make these some time soon. I agree: though home made is best for sauces and such, grabbing a jar of home made sauce to go with a meal made at home is still better than ordering/picking up pizza or something. By the way, that was sweet of David to say that about your cooking. Let me know what you think of the recipe when you get a chance to try it. And yes, it was awfully sweet of David. I love enchiladas- they seem to be a kitchen-sink kind of meal too, where I can add a lot of veggies in there and then slather it in cheese and my husband still loves them! Thank you so much for the blog visit. It allowed me to discover and follow you! This recipe looks so good. I have been trying to eat less meat, and still be satisfied, so this sounds like just the thing for me. I have already put enchilada sauce on my shopping list (the only ingredient I am lacking), and look forward to giving these a try. Sadly, my Aldi tulips never opened. 🙁 They did look pretty in their bud state though. My husband likes meat but he still said these were some of the best enchiladas he’s had. My Aldi tulips have been sort of weird. The first night I bought them and put them in a vase they were sort of droopy. But then they actually ended up looking better several days later. They didn’t open, either, but most of them still look pretty good. I had a couple of bouquets so last night I pulled the best from each one and made one arrangement. I should get another couple of days out of it. It’s always hard for me to say goodbye to fresh flowers. How nice to see you here at Full Plate Thursday and with these amazing Cheesy Black Bean Enchiladas. We love Enchiladas and your recipe is one that I will be making. Have a great week and come back to see us real soon! Thanks for stopping by. I hope you enjoy the enchiladas. My husband raved about them. I’ll be sharing a recipe tomorrow and I’ll be sure to link it on Full Plate Thursday. Have a beautiful evening!